The New York Times editorials about the last two elected Republican presidents to die, Ronald Reagan and George H.W. Bush, have strong similarities, calling them both fortunate in their foreign policy victories, comparing them positively to the current GOP office-holders, and bemoaning the negative state of politics under the current commanders in chief. Reagan, the 40th president, died in 2004 at the age of 93, and Bush, his vice-president who succeeded him as the 41st president, died Friday at the age of 94. The Times in 2004 took the occasion of his death to mourn the George W. Bush administration's policies and "decade of political mean-spiritedness" while praising Reagan's "collegiality and good manners." "Looking back now, we can trace some of the flaws of the current Washington mindset – the tax-cut-driven deficits, the slogan-driven foreign policy – to Mr. Reagan's example," the board wrote of Reagan. "But after more than a decade of political mean-spiritedness, we have to admit that collegiality and good manners are beginning to look pretty attractive." It also hit Reagan for turning the GOP away from its "fiscally conservative roots" and for George W. Bush's decision to still espouse the principle that tax reductions boost the economy. "Although Mr. Reagan did reverse course and approve some tax increases in the face of mounting deficits – in stark contrast to President Bush nowadays – he was still responsible for turning the Republican Party away from its fiscally conservative roots. The flawed theory behind the Reagan tax cuts, that the ensuing jolt to the economy would bring in enough money to balance the budget, is still espoused by many of the Republican faithful, including President Bush," it wrote. Of the 41st president, the board waited until the second paragraph to contrast Bush's personality with that of Trump's. "Yet, at the moment of his passing, it is difficult not to take note of the profound differences between the 41st president of the United States and the current occupant of the White House, Donald Trump," it wrote. "Beyond a desire to be president — Mr. Bush was more competitive and ambitious than his self-effacing personality sometimes suggested — there is almost nothing in common: the one gracious and modest, the other rude and vain; the one prudent, the other brash; the one steady, the other unmoored." The boards in 2004 and 2018 also suggested Reagan and Bush were beneficiaries of good fortune while discussing their foreign policy successes. Together, Reagan and Bush oversaw the collapse of the previous generation's main adversary, the Soviet Union, and the end of the Cold War. On Reagan: "He profited from good timing and good luck, coming along when the country was tired of the dour pedantry of the Carter administration, wounded by the Iranian hostage crisis, frustrated by rising unemployment and unyielding inflation. 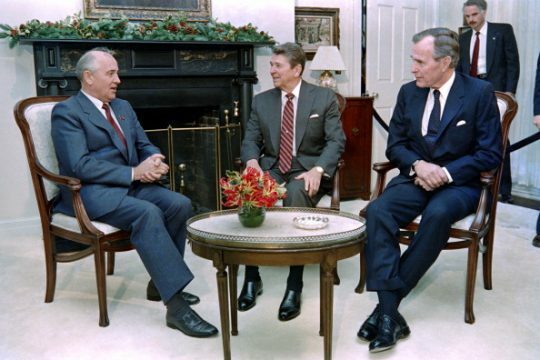 Mr. Reagan's stubborn refusal to accept the permanence of Communism helped end the cold war. He was fortunate to have as his counterpart Mikhail Gorbachev, a Soviet leader ready to acknowledge his society's failings and interested in reducing international tensions." On Bush: "Fate had dealt him one of the strongest hands in foreign affairs ever awarded a new president, and for the most part he played that hand cleverly and energetically." The Times did not endorse Reagan or Bush in any of their presidential bids in 1980, 1984, 1988 or 1992. Indeed, the Paper of Record has endorsed the Democrat in every presidential election since 1960 when John F. Kennedy ran against Richard Nixon. This entry was posted in Politics and tagged George H.W. Bush, New York Times, Ronald Reagan. Bookmark the permalink.